Looking for a great book to read at the beach or sitting in front of a cozy fire? This is it! 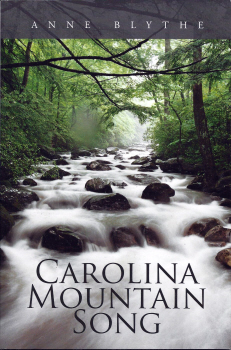 You will be entertained by and fall in love with the characters in Carolina Mountain Song. Anne Blythe, literary historian, poet, and seventh-generation South Carolinian, lives in a hundred-year-old cabin in the foothills of South Carolina, where her paternal ancestors settled in what is known as "The Dark Corner." This is her first novel. When Tay Ferrell returns to her beloved mountain, little does she expect to become the center of a fierce battle to preserve---or destroy---the land and its heritage. Nor does she expect a compelling figure from her past to hold the long-lost key to her future. just closely enough related to love and hate one another. Innocence and corruption, unrequited love, jealousy and emotional blackmail set the stage for this memorable story to unfold. Anne Blythe's CAROLINA MOUNTAIN SONG is aptly titled. It has the lilt, the mystery, and the lyricism of one of the good old ballads and tells a tale that would fit neatly into song. And it spins along at a spirited, almost dizzying, pace, being what some folks call "a page-turner." It is just pure fun to sail through and I thank the author most heartily for writing it. Now, author, go write another. Please. -Fred Chappell, author of I Am One of You Forever; Farewell, I'm Bound to Leave you; Brighten the Corner Where You Are; and other novels, poetry, and story collections. Anne Blythe, a fine writer with a couple of centuries of hill country ancestry behind her, has given us a lovely book in Carolina Mountain Song. The right ingredients are here - the homecoming of a likable, grown-up heroine' a nasty femal adversary it's fun to hate; a grand old auntie who's wise to the good earth and the clever moves it takes to hold onto a little piece of it - and, a second chance romance, bound for a joyful ending. Mixed with a deft, light hand, it's a sweet satisfying read, from a storyteller who clearly has more where this one came from. -Dot Jackson, author of the best selling Refuge. Book price is $20 plus $6.95 for 1-3 books shipping and handling and 6% SC sales tax if applicable. Carolina Mountain Song By Anne Blythe. Novel, published by XLibris Press. Publication date: January 2011. Outdoor Adventures in the Upcountry. Essay by Anne Blythe (Emma Chisolm), "Flyfishing and the Art ofa Woman's Healing." Hub City Press, Spartanburg, Sc. November 2010 publication. Chronicles of Chicora Wood. By Elizabeth Allston Pringle. Her antebellum memoir. With an introduction by Anne Blythe. To be published by History Press of Charleston, 20II. Blood of My Blood, by Marjorie Kinnan Rawlings. Edited and with a Foreword by Anne Blythe Meriwether. Gainesville, Florida: University Press of Florida, 2002. Rawlings' "lost" first book. Circle of Inheritance: A History of Colonial South Carolina. Teacher and Viewer Guide. By Anne Blythe Meriwether. Columbia, SC: South Carolina Educational Television, 1999. A Woman Rice Planter,by Elizabeth Allston Pringle ("Patience Pennington"). Edited and with an introduction by Anne M. Blythe. Columbia, SC: The Seajay Society, 1991. Reissued as Vol. II of The Collected Writings of Elizabeth Allston Pringle by The Reprint Company, Spartanburg, S.C., 1991. Rab and Dab,by Elizabeth Allston Pringle. Edited and with an introduction by Anne Blythe. Columbia, SC: The Seajay Press, 1985. Reissued as Vol. I of The Collected Writings of Elizabeth Allston Pringleby The Reprint Company, Spartanburg, SC, 1986.